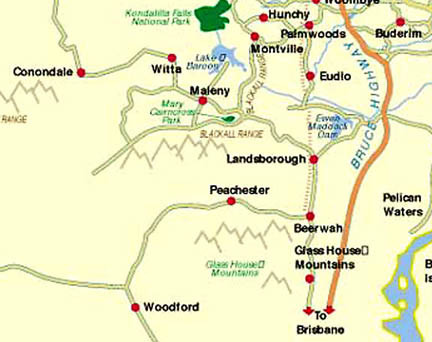 Black arrow points to Conondale valley region that is small dairy farming community a couple hours by car northwest of Brisbane, Queensland, Australia. Conondale is the location where the March 28, 2004, four grass circles were discovered. Conondale is about 50 minutes northwest of the Glass House Mountains where sorghum was found downed in May 2003. Some investigators thought natural lodging explained the sorghum event. 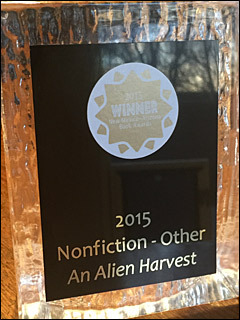 In both years and locations at the time plants went down, local residents reported seeing unidentified lights. 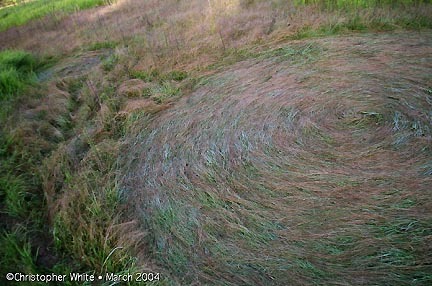 April 14, 2004 Conondale, Queensland, Australia – Australian crop circle researcher and author, Richard Giles, reported in Swirled News that the two local teenagers in Conondale who first spotted the four grass circles on Sunday afternoon, March 28, were Eli Colbran and Tom Braby. 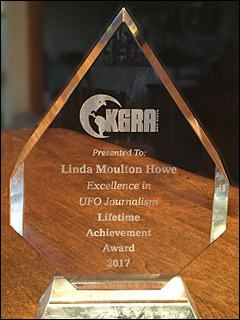 Giles also reported, “Two local residents living within a kilometre (two thirds of a mile) of the site who spoke to Christopher White and Kate Dash reported seeing bright blue flashes of light at about 11 p.m. or 12 midnight on Saturday and another spoke of a strange musical note they heard around midnight. 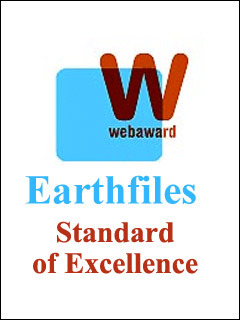 Others told me of strange lights they had seen at night around the Conondale valley over the last few years. 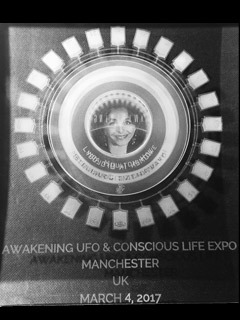 One women told of a spectacular aerial light display she and her girlfriend saw late one night several years back. The valley does seem to have a history of unusual lights. Christopher White was born in New Zealand forty-seven years ago and moved to Australia thirteen years ago, first near Adelaide and more recently he moved into the Conondale valley west of Maleny and Montville “because I love the fresh feel of the land and air there.” Christopher’s day job is in a restaurant, but his hobby is photography. 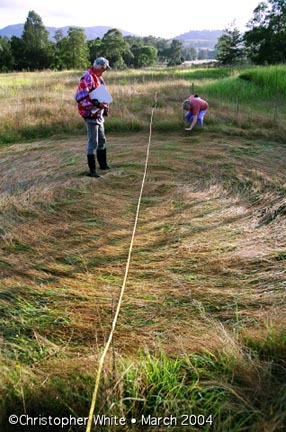 He has also been fascinated by crop formations, but has never seen a physical circle in plants until the grass circles appeared only about six kilometers from his home. I talked with Christopher about his observations in the grass circles both Sunday night, March 28, and early Monday morning, March 29, 2004. 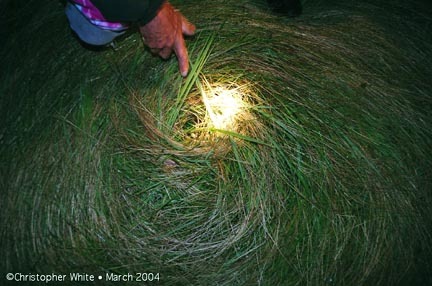 The night of Sunday, March 28, 2004, Christopher White photographed a research colleague holding a flashlight on the center of one of the four neatly clockwise-woven circles discovered that night in pasture grass near the dairy village of Conondale, Queensland, Australia. Photograph © 2004 by Christopher White. We took torches and were quite amazed. We walked up the embankment into this empty field and it was kind of ‘Wow!’ because I had never seen crop circles before ­ only on television and in books. The large circle was right in front of us and we figured at the time it was about 8 meters and it turned out to be 7.9 meters when we measured it the next morning. We found the next smallest size which was about 4 meters which was just south of the largest one. It was those two circles that I photographed the most. We had been told there were four circles and we found all four of them in a straight line. Starting from the north, you have the smallest circle (.85 meter), then the next size up (1.8 meters), then we had the largest circle (7.9 meters) and then the next size down (4 meters) at the most southern end. They were aligned exactly 20 degrees east of north, magnetic north. As a photographer, I was very keen to (see them). We were very respectful, which is a good way to describe it. We did not want to disturb them. Initially, we were a little reluctant to walk into them and we were very gentle when we did, almost on tiptoe. 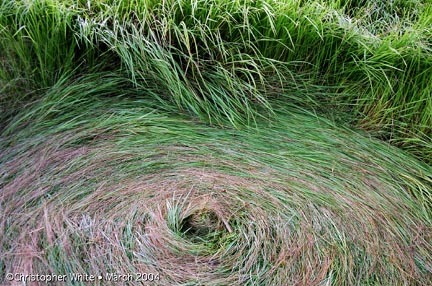 The grass was exquisitely woven together. 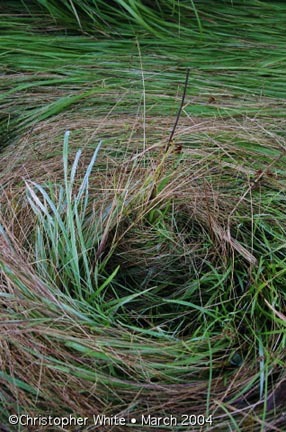 There were two or three different types of field grasses there and it was like they had been literally blended and woven together, almost like a basket in this beautiful clockwise swirl. It actually had a rippled effect that you can see in some of the photographs the next morning, a little rippled inward. COULD YOU TALK ABOUT THE SURPRISE YOU HAD LATER WHEN YOU GOT THE FILM DEVELOPED? During the night, we didn’t notice any light anomalies at all. I took photos as I felt. I tend to be more of an intuitive photographer. 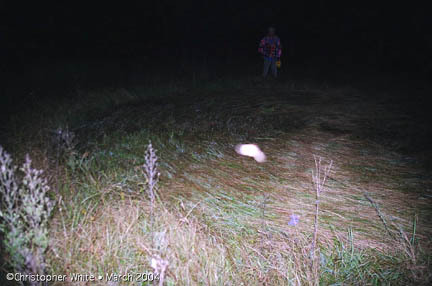 The first light anomaly was in the largest circle and I discovered another in a photograph at the southern most circle. It was a day or two later that I had the film processed and saw the largest circle with the multiple frames of light bouncing in the middle of the circle. I was completely blown away! It looked like it was vibrating in a way, going backwards and forwards almost. I found that really fascinating. 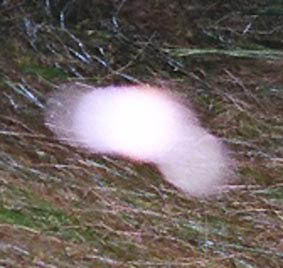 Above: White light anomaly on photograph of largest grass circle in line of four discovered March 28, 2004, in Conondale, Queensland, Australia. No lights seen by researchers when 35mm color photographs taken. Below: Blow-up of the light anomaly. Camera was Canon EOS-10, Fuji 400 ASA color film, estimated 125th/second time exposure with automatic flash. 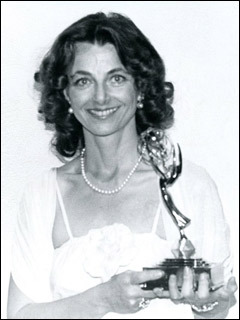 Photograph © 2004 by Christopher White. Once I saw that photograph, I thought, ‘That’s it!’ I was so excited to find that I had actually caught on film one of these light anomalies which I had always been really fascinated with and have seen only in documentaries and books. 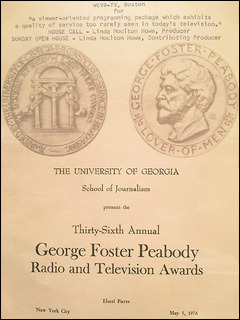 Then a couple of days later, I thought I found a speck on the index photographs of my CD-ROM with the pictures on them. I thought, ‘Oh, my God!’ So I popped the photo on my computer screen and there was another light on the far edge of the southern most circle all on its own. 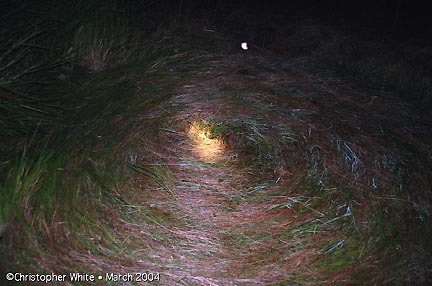 Second white light anomaly discovered in photograph of the southern most grass circle in the line of four discovered March 28, 2004, near Conondale, Queensland, Australia. Photograph © 2004 by Christopher White. WHAT WAS THE TIME EXPOSURE ON YOUR CAMERA? It probably would have been 125th of a second which is about as fast as this camera will go with the flash going at close to full speed. I didn’t use on that particular frame a flashlight to focus the lens. The lens focuses in infrared and did it on its own. And in all of my years of photography, this is probably the most exciting photograph I have ever taken. I am utterly thrilled. I WISH I KNEW WHAT THE ANSWER IS TO THESE MYSTERIOUS LIGHTS ­ WHAT EXACTLY THEY ARE AND WHAT EXACTLY THEY DO. It’s triggered off something deep inside me. It’s very difficult to explain. I have renewed life and excitement that kind of surprises me. I really love it. 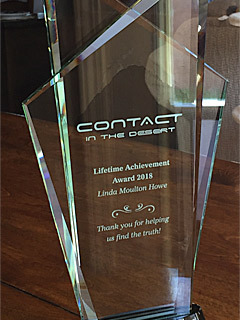 SOME PEOPLE COMPARE IT TO GETTING CLOSER TO THE MYSTERIOUS LIFE FORCE IN THE UNIVERSE. That may well describe it. There is definitely a sense of turning point, as if now I’m going to invite more into my life like that, and I do want to focus more on something like that. Monday Morning, March 29, 2004, at 6:30 a.m. The circle that really intrigued me was the southern most circle. The southeastern edge was a completely different type of grass ­ a big high, blady type of grass, green grass, that was woven into the corner edge of that circle. Flowing into that was what appeared to be a pathway about 18 inches to 2-feet-deep into that grass, almost like a semi-circle of energy had gone into there and it was so obvious that I pointed it out to my friends. It flowed into that circle as if it was part of it. 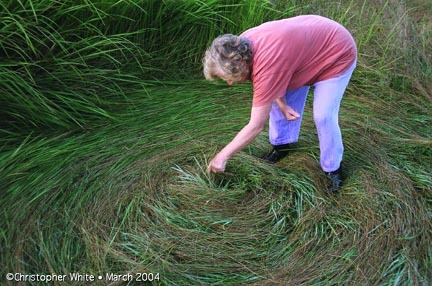 Retired English teacher, Kate Dash, examined one of four clockwise “combed” circles in wild pasture grass in the small farming town of Conondale west of Maleny in Queensland on March 29, 2004. 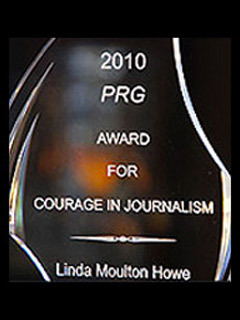 Photograph © 2004 by Christopher White.